Projects – Acacia Maden İşletmeleri A.Ş. The Gokırmak Copper Project owned and developed by Acacia Mining Operations Inc. is located within the boundaries of Hanonu District of Kastamonu Province. As the easternmost district along the boundary of Kastamonu Province, Hanonu is situated 40 km from Boyabat District of Sinop in the East and 25 km from Taskopru District of Kastamonu in the West. The access from Hanonu District, where the project site is located, to other city centers by land is provided by a two-lane road. The district has a very favorable position regarding those airports and seaports available in the region. Kastamonu Airport is about 1-hour travel away by land at 70 km West of Hanonu district. Sinop Airport is located 120 km to the District, the access to which can be provided by about 1.5-hour travel by land. The leading airlines in Turkey have daily shuttle flights from Istanbul to both airports. The distance by land from the district center to local seaports along the coastline of Black Sea is 155 km for Inebolu Seaport and 225 km for Samsun Seaport. 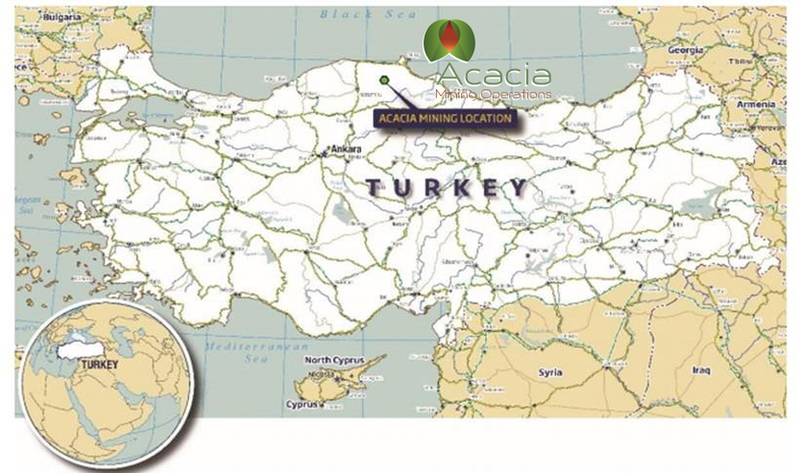 Since 2007, Acacia has been carrying out development and construction activities in license areas that also contain Gokirmak Copper Project. The critical findings obtained by governmental agencies of the previous terms and the exploration activities focused on underground galleries driven in the earlier times were continued throughout the license area and adjacent sites. With the involvement of Ilbak Holding, one of the leading Turkish entities, in the project in 2011, the activities were driven in accordance with international standards. Following the engagement of specialized international companies, the detailed ore prospecting schedule was continued in the project site. Under this schedule, many on-site activities were carried out for Gokirmak Copper Project, such as geophysical and geochemical studies, exploratory drilling operations, geotechnical and hydrogeological drilling operations, and water observation and control studies. A Feasibility Study Report was prepared by IMC, a company based in Germany, in early 2014 following the detailed ore prospecting and project development activities. In addition to this report generated, environmental and social impact assessment studies, detailed engineering, plant and infrastructure studies and geotechnical and mine planning improvement studies were accomplished by specialized companies under the leadership of Acacia. All these studies completed by AMC, a company based in Austria, in the last quarter of 2015 were presented in the extended scope of the Detailed Feasibility Study Report. The involvement of Akfen Holding, having the leading position in any industries engaged, in the project in 2016 expedited the on-site activities of the project with the scope of such activities extended. In parallel to technical and construction activities that already continued in the first quarter of 2017, the Detailed Feasibility Study Report was updated in May 2017 with the inclusion of environmental and social impact assessment reports completed in accordance with the European Union Environmental and Social Policies, detailed engineering studies conducted at international standards and norms, and mine resource and reserve estimations developed in line with JORC standards. For the purposes of Gokirmak Copper Project, the aim is to initiate ore production in the 4th quarter of 2018 and continue concentrated ore production as scheduled. Under Gokirmak Copper Project, 2,000,000 tonnes of run-of-mine Copper ore are scheduled to be produced per annum. In this context, the construction and installation activities are ongoing for the plant operation to be operated with modern equipment. Additionally, a waste storage plant is in under construction and overburden stripping operations continue in the pit area as scheduled. The life of mine is scheduled to be about 12 years under the project that aims to produce 1.3M tonnes concentrated ore over the course of total mine life. Gokirmak Copper project is a project designed to produce copper concentrate which is an intermediate product obtained during the production of metallic copper from copper ore.
Gökırmak Copper Mine has copper reserves of approximately 24 million tons with a grade of 1.5%. The mine was initially prospected in 2007 and the investment decision was taken in 2017. The method of mine production is open pit production. From the Open Pit, 2Mtpa copper ore containing 1.5% Cu will be produced for a period of 12 years. The total amount of copper ore to be extracted from the mine is approximately 24,000,000 tons and the metallic copper content is approximately 360,000 tons. Approximately 120 thousand tonnes copper concentrate containing 22% copper will be produced per year. The project investment amount will be USD 300M. 40% of this amount are covered through owner’s equity and the remaining 60% through the project funding provided by the consortium of three foreign banks. The project has the potential to grow larger. The expectation is that the mineral reserve will be enhanced by additional drilling operations to be carried out over the course of mine life and the mine life will be increased over 20 years. Throughout the life of the mine, it is foreseen that 700 employees will be provided directly and 350 persons will be employed indirectly sums up to 1.050 people. 12 billion Turkish Lira foreign exchange inflow is expected from the export that we will make over the 12-year mine life. In addition to this, the project will contribute greatly to the economy of Kastamonu and Turkey will be about 6 billion Turkish Liras.